Smart Bro outs Prepaid LTE Home WiFi. Here's everything you need to know about this device. Smart announces the Smart Bro Prepaid LTE Home WiFi which is gunning for Globe's Prepaid Home WiFi. The device is basically a plug-and-surf modem which utilizes 4G LTE network to shoot internet connectivity at home. Since Smart is now using the 700MHz LTE band, it is expected that indoor signal reception is better than its other LTE-powered devices. For prepaid subscribers, Smart is asking a one-time fee of Php 1,995. In turn, you'll have the device with 10GB of free data allocation valid for 7 days. How to Set-up Smart Bro Prepaid LTE Home WiFi? Step 2: Turn on the Switch located at the side of the device. Step 3: Place it in the area with best signal. It comes with light indicators: Blue for Best Signal, Green for Good Signal, Red for Bad Signal, Blinking Red for NO SIM or Signal. Step 4: Attach the device's stand to have a sturdy set-up. Step 5: On your device, search for Smart Bro WiFi using smartbro as default password. 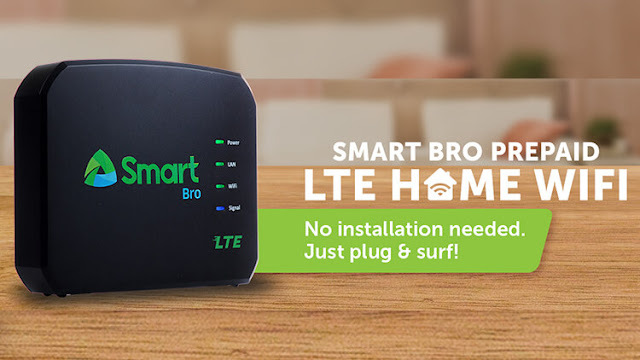 What are the benefits using the Smart Bro Prepaid LTE Home WiFi? Aside from better signal penetration, the LTE Home WiFi is 2x Faster than a Smart Bro Pocket WiFi. You can also connect up to 10 devices. How to Load Smart Bro Prepaid LTE Home WiFi? You can top up with a Smart Load Card available in Smart Stores or any other dealers nationwide. There are three ways to load. Step 2: Click "SMS" then click "New Message"
You can also load anytime with your Smart Bro retailers nationwide.